We survey a different Study Bible weekly. Our Study Bible reviews are designed to help you choose the best one for you. Do you have what’s best for you? Study Bibles are a great tool to help you in your Christian walk. They offer you the single best tool for quick reference on verses of Scripture where comments are helpful to develop understanding. With over 50 different reviews coming, we will offer you the opportunity to make informed purchase decisions. We want you to have the best tools possible in your spiritual growth and at the same time we want you to spend your money wisely. So our reviews help you in those two way personally. But we also understand you may wish to offer the best gift possible to somebody. So we can help you to help someone else - And that makes everybody happy. 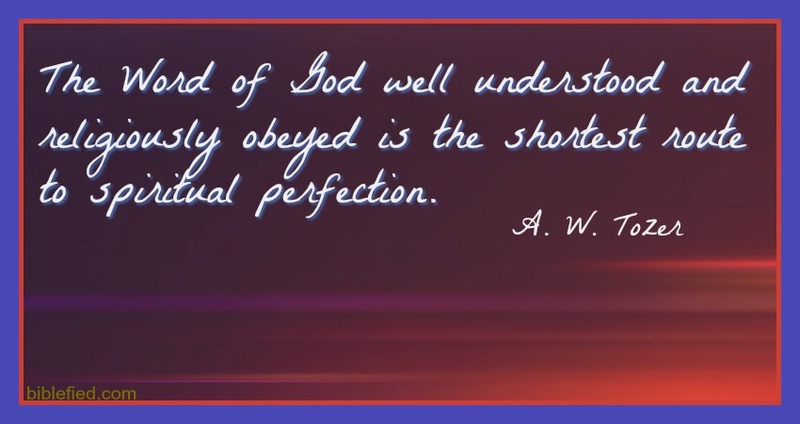 As the quote from A.W. Tozer Study Bible shown here illustrates, you must first understand the Word of God before you can obey it. We're not sure it will lead to spiritual perfection, but purchasing the right tool can go a long way in your journey. The best Study Bible is the one you'll use the most. So the first question becomes: What am I looking for in a Study Bible? Perhaps you're struggling in a particular area of your life and you want a tool to help you strengthen that aspect of your spiritual life. For example, if your need is to develop a better understanding of stewardship, you may want to consider purchasing a Stewardship Study Bible to help you with that. But it's not always that easy. However, what we do know is that everybody needs to grow spiritually and you can do that with any Study Bible because after all, it is a Bible. The study notes are good but the biblical text is the true value. Generally, the value of the study notes are that they help you understand the biblical text. If you're like everybody else, sometimes you need some references on different Scripture passages to understand the meaning so you can apply the biblical principles in your life. We said earlier the best Study Bible is the one you'll use the most. The worst Study Bible is the one you never use. As we get further along, we'll develop more tools to help you sort through the many options available. Our goal is to help you choose the best Study Bible for you.